From a number of deliveries or sales orders more than one billing document is created. As a rule, the system combines into one billing document all transactions for the same customer, default billing date and sales organization. If data from the related reference documents differs in the header fields of the billing document, the system will automatically split the invoice. On the detail screen of the document flow table (TVCPF) in the entry field 'DATEN VBRK/VBRP' (as of Rel.2.2..: 'Data transfer') the routine '003' (single invoice) was entered and thus an invoice split was created. The header partners in the billing documents created are not identical which causes an invoice split. With regard to partner processing, an invoice split also occurs if the entries in the partner table of the reference document and the billing document also differ only in one field (!) 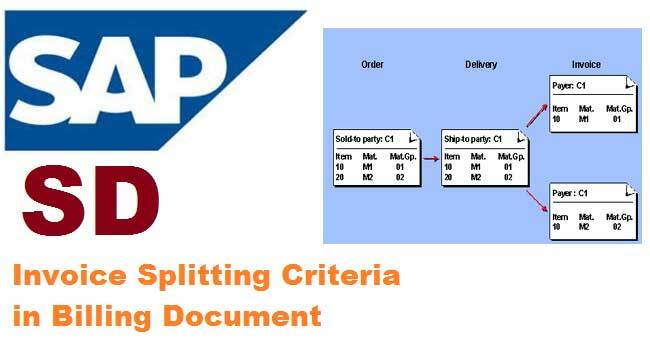 for the partner functions of the billing document header (in the standard system, these are SP, BP and PY). The header fields in the billing documents created are not identical which causes an invoice split. Attention: Not all header fields in the billing document are visible on the header detail screen of the billing document. To analyze the cause of the split, as of Release 3.0 you can use the 'Split analysis' function in the Environment menu when displaying or creating the billing documents. These fields should not cause a split. You can find the source code relevant for this in program LV60AF0X, FORM routine XVBRK_BEARBEITEN. 4. When using transaction VF04 or Billing (background) the date of the billing document (e.g. the current date) must be entered (In VF04: settings, default data. In VF06 or background: variant with parametrization) to avoid an unwanted split due to the billing date. 5. To avoid a split due to different header fields - except for the fields listed above - you have the option of using customer-specific data transport routines in the copying control of the relevant document types which initialize the corresponding fields. However, the information contained in these fields is then lost in the billing document. Buyer place order for 80 M.ton of same material. Material clared under single invoice; loaded in four trucks; as per excise rules each consignment/lorry shall accompany excise invoice. Hera excise invoice are 20 M.ton X 4 lorry but commercial invoice is single for 80 Tons. Outbound for 80 M.Ton in four lorry/consignment note. How SAP system support !